The Sims 4 ‘Life is a Beach’ mod is the most fun I’ve had with the game in ages. 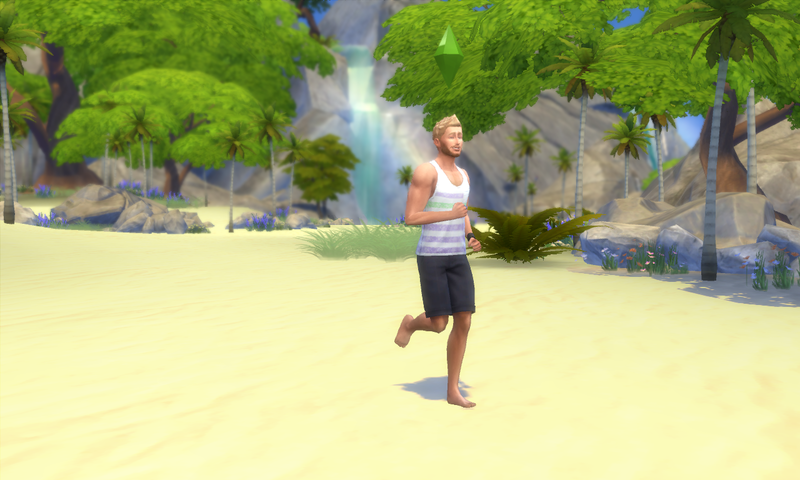 REVIEW: The Sims 4 – ‘Life is a Beach‘mod by TheSimplyNando. 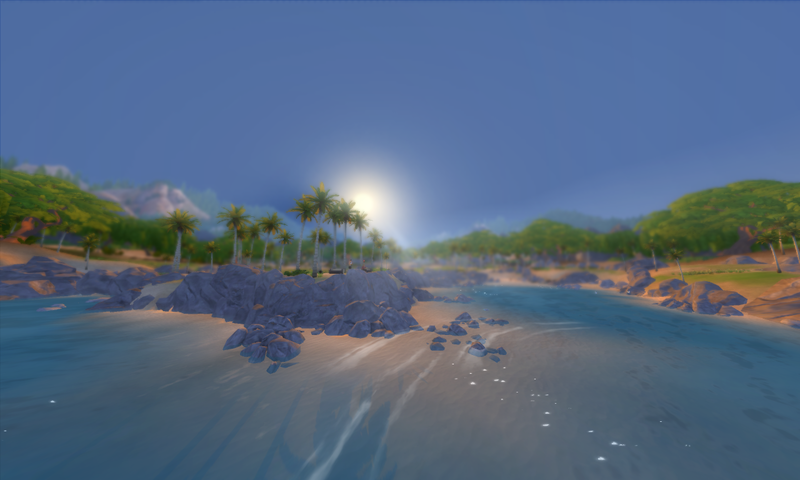 TheSimplyNando is the brains behind an ambitious Sims 4 mod which transforms Granite Falls (a town from the Outdoor Retreat extension pack) into a beautiful beach. The redesign changes the layout of trees, colours the terrain to a sandy tone and makes the town seem brighter overall. While it may seem like the modification isn’t that big of a deal, it can provide a brand new set of story techniques for sim gamers. The coast of Granite Beach |Image: Screenshot from game. The modding community in The Sims 4 is smaller compared to its predecessors. Despite the lack of mods, there are still some talented customisations to the game such as this mod. The beauty of The Sims 4 closed environment is that it emulates playing with a doll house. Towns are small, so players are forced to imagine and simulate a storyline in their head. EA’s new extension pack Get Together brings a similar coastal setting, yet Life is a Beach rewards players with a more remote setting. I chose to combine this mod with Zerbu’s World Type Changes Mod, allowing Granite Beach to be a residential world. Having removed all the lots in this town, I chose to utilise this remote setting as an abandoned island resort. Three of my sims became ‘castaways’ in this island and had to build shelter, build a business and build a home. Yes, I’m replicating The Sims 2 Castaway with The Sims 4 gorgeously updated engine. One of my three survivors | Image: Screenshot from game. There couldn’t have been a more perfect timing with this mod. Released on December 21st 2015, the mod follows up on Get Together‘s release. My sims managed to form clubs with other survivors in the island, where they’d garden, build furniture, fish and survive together. 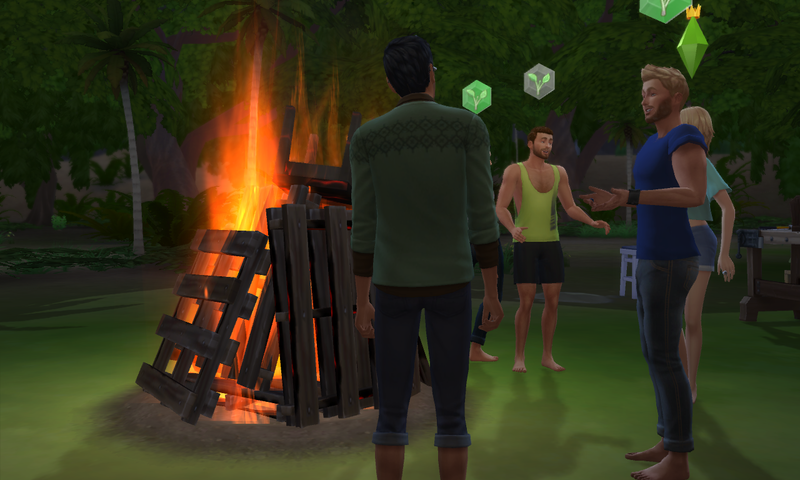 Sims would use Get Together‘s new bushes as toilets and light up Get Together‘s new bon-fires. By the end, my sims were able to form a retail store selling the fruits, fish and furniture gathered. Get Together meets Life is a beach | Image: Screenshot from game. Survival is key. Outdoor Retreat‘s scattered bonfires or park rangers help illustrate this survival scenario. The lack of roads in the map makes the beach seem more explorative than other Sims 4 maps. As a whole, the new atmosphere combined with EA’s extension packs managed to create really engaging gaming moments in The Sims 4. My aim is to make this beach an habitual environment. A beach bar is being constructed, a town hall is being constructed, houses are being constructed. These gameplay goals are enhanced by the existence of Life is a Beach. Whilst this beach mod is just a redesign, it opens up many new possibilities of gameplay styles. TheSimplyNando has stated that he intends to bring: “new lifeguard career, new food and new social events with the next beach mod update”. Life is a Beach is available to download now. Prev Guitar Hero Live’s companion app is STILL dysfunctional. Next Guitar Hero Live’s ‘Rival Mode’ to be patched tomorrow. Mods can break the game though, if mods were 100% safe, then I’d have this one, as I love beaches. Luckily most mods tend to be updated often that there’s a lack of issues. I don’t recall any specific problems from the beach mod if you would want to try it out. what do you do in order for the mod to work or do i have to have anything ? Just download the mod from the link and then place the files in – Documents/Electronic Arts/The Sims 4/Mods. It’s that simple!